UU A Way Of Life: How can we apply the third principle? How can we apply the third principle? Unitarian Universalists covenant together to affirm and promote seven principles, the third of which is acceptance of one another and encouragement to spiritual growth in our congregations. The principles are beautiful, broad, and general enough that everyone can agree with them. It is easy for UUs to agree with the “what” of the principle, however the challenge is in the “how.” How do we apply the principles in our daily lives? Where does the rubber hit the road? 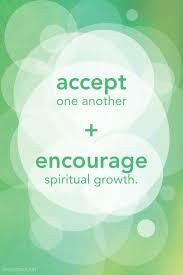 If we agree to affirm and promote each other’s spiritual growth, how do we do that? What are the paths that we can let each other know about, and when appropriate, encourage each other to take? What is your interior spiritual life like? As a psychotherapist myself I don’t always explicitly ask my clients these questions because they have more immediate and practical issues on their minds they want to discuss, but I am always alert to little clues about the client’s world view. As I get to know people better, I usually get a sense of how they might answer those questions. When we have developed a good therapeutic alliance and it seems appropriate, sometimes I will ask, “What is your interior spiritual life like?” At first, I was hesitant to ask not wanting to scare people or confuse them, but as I have experimented, I have never received a negative response, The responses have always been positive. A person can’t ask what is your interior spiritual life like, unless he or she has thought about it him or herself. My interior spiritual life was informed first by my Roman Catholic upbringing, and later in my life I studied the teachings of Bhagwan Shree Rajneesh who renamed himself Osho, and for the last 30 years I have been a student of A Course In Miracles. In applying the third principle in my own life I am curious about your path. What is your interior spiritual life like? To share our stories is to experience encouragement in our journey home together and is where the rubber of the third principle hits the road.